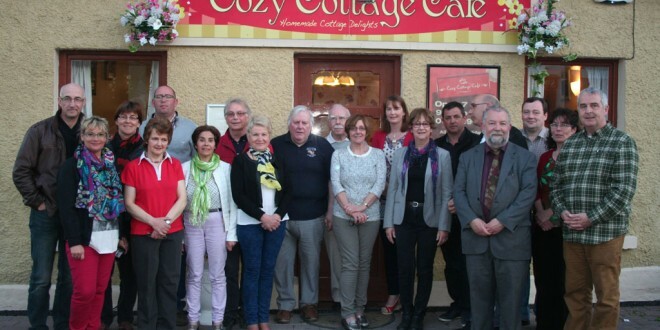 The Sixmilebridge and Nort-sur-Erde twinning committees pictured outside The Cosy Cottage in Sixmilebridge. THE foundation stones for a twinning arrangement between Sixmilebridge and Nort-sur-Erde were firmly put in place this weekwhen a delegation from the French town, led by their mayor, Yves Dauvé, visited the Clare village. Strong bonds were forged between the two communities after the Sixmilebridge Twinning Committee extended the hand of friendship to the visiting delegation, by treating them to an action-packed weekend of culturally-themed events. The party of 10, led by Mayor Dauvé, arrived on Wednesday evening and were welcomed by the Sixmilebridge Twinning Committee, headed by chairman Gerald McErlain, at a reception in The Mill Bar. Once introductions were made, the parties settled into an informal and relaxed evening, with an exhibition of set dancing by the children attending classes in an adjoining room. A busy itinerary got going early on Thursday morning, when the group was given a guided tour of Bunratty Castle and Folk Park. The richness of the park and castle’s focus on life in times gone by were compared to a similar rural lifestyle in France of old. The group headed to Ennis and its winding streets next for a taste of a modern Irish town. The group was impressed with the colourful character and busy tourist and commercial vitality of Ennis. From Ennis, it was on to Dromoland for a stroll along the walkways, before a visit to Quin and the abbey. Evening saw the group in Kilmurry for a gathering hosted by the Kilmurry Harvest Festival Committee. The Sixmilebridge Angling Club, headed by chairman, Brian Nolan, displayed the richness of local angling and the opportunity for inbound angling tourism from France was presented. Seán Collins put on a display of vintage farm equipment and presented each member of the visiting delegation with a brass plaque. The group visited St Mary’s Church and hall, before retiring for an evening of music and dance with the Kilmurry Teen Trad group in The Pumphouse. Friday’s itinerary started with a visit to third-class pupils of Sixmilebridge National School, where the delegation met pupils and teachers, before heading for the Cliffs of Moher, where the weather obliged to showcase the cliffs. From Moher, it was on to Doolin for lunch, before taking the Wild Atlantic Way north to Black Head and Ballyvaughan. The route back to Sixmilebridge crossed the Burren National Park, where the landscape held the attention of the French visitors. It was back to Bunratty Castle for the evening banquet, complements of Neil Pakey and the Shannon Group. Saturday morning got off to an early start, with local farmer, Pat O’Reilly from Rathmore guiding the group around his farm in Kilmurry. Agriculture and farming are strong features of both Nort-sur-Erde and Sixmilebridge and the group was impressed with the quality associated with beef production on a local farm. Keeping agriculture to the fore, it was on to Sixmilebridge Co-Op Mart to see how a local enterprise operates to the advantage of local farmers. From the mart, the group visited Sixmilebridge library, the local Scout hall in the restored railway station and the GAA field for a display of hurling. Pa Sheehan provided an insight into the skills of hurling and the history of the club through French and interpreted questions and answers. The busy schedule took the group to Kilkishen, where Elizabeth Brady brought the group on a bog walk and then back to the restored Church of Ireland building, home to Kilkishen Cultural Centre, for afternoon tea. The Cosy Cottage in Sixmilebridge was the venue for the formal evening, where the Nort-sur-Erde and Sixmilebridge twinning committees enjoyed an evening of good food and craic, thanks to Martha Kearney and her staff. Cathaoirleach of Clare County Council, John Crowe officially accepted a proposal of twinning from Mayor Dauvé. Cathaoirleach of Clare County Council, Councillor John Crowe, right, presents Mayor Yves Dauvé with the County Clare coat of arms. An invitation for a reciprocal visit to Nort-sur-Erdre was extended to the Sixmilebridge twinning committee by Mayor Dauvé. It is expected that a delegation will travel to France at the end of August for the Nort-sur-Erdre jazz festival, when they will celebrate 10 years of twinning with Piedrabuena in Spain. Mayor Dauvé presented Councillor Crowe with a book and a selection of wines from the Loire region, home to Nort-sur-Erdre. 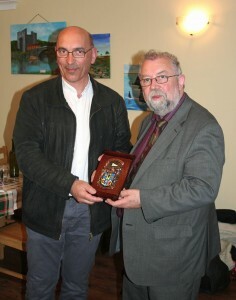 Mayor Crowe, in turn, presented Mayor Dauvé with the County Clare coat of arms, for display in the Nort-sur-Erdre town hall. Once dinner was finished, in traditional Irish country style, the tables and chairs were put back against the walls and the Sixmilebridge folk group tuned up for a super night of music, song and dance. Set dancers put on a fantastic display and, before long, the French visitors were ‘ag rince’ along with their Irish hosts.